This is a queen sized quilt. The top is made of silk and the batting is wool. The backing is cotton. 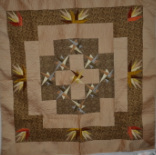 The picture on the lower right is a close up of the center of the quilt. While this quilt is already spoken for, there will be others available soon! Save Our Seniors - Akita Rescue of Western New York (SOS-ARWNY) auctioned off this quilt at the Akita Nationals in Indianapolis to help the older dogs stay in or find loving homes! 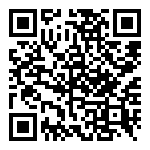 This is our QR Code (below). If you have a smart phone or another device that can scan this and read our information off the code, you can send it to everyone you know! Let them know about us...and we can help more rescue groups!